The Hunger Games: Catching Fire (2013 - 2 hr, 26 min, 14 sec) is the sequel to the insanely successful The Hunger Games (2012). The film was directed by Francis Lawrence and based on the original novels by Suzanne Collins. The film picks up the story almost straight after the events in the first film. Katniss and Peeta (Josh Hutcherson) are forced by the President (Donald Sutherland) to pretend to be in love, since Katniss’s refusal to kill Peeta and to sacrifice them both could look like it was either driven by love or an act of rebellion. The Capitols hold on the downtrodden districts is more tentative than their propaganda would lead the population to believe, so the president sets out to portray the two as doomed lovers and he intends to make sure they are doomed by insisting that all the previous survivors of the games are involved in the 75th games. There was always going to be a problem selling a film, to the non-fan base, which essentially covered much of the same territory as the first. Even though the new games involve only the past winners, rather than tributes the format remains the same. Of course, there is more going on than is revealed on the surface and some of instances in the film will not make complete sense until the final reveal. Some of the film did not work well, one relationship in particular. Books and films are different beasts, so the film expanded on what was happening in the Capitol, but I can’t help but feel that this led to some information being taken as read. For those who did not have a significant knowledge of the books, the relationship between Katniss and Peeta makes little sense. At the top of the film it is strongly intimated that Katniss is in love with Gale (Liam Hemsworth). True, she owes Peeta a great deal, certainly enough to pretend to get engaged to him to protect their families, but often through the film her desire to protect Peeta, even at the cost of her own life, seems a little inexplicable. Readers of the books will know what’s going on, but as a structured film narrative it is a little jarring. The strength of the film, relationships aside, is an intelligent script and a universally good cast, especially Jennifer Lawrence (Katniss) as the central character who is being forced into the unlooked-for position of becoming the focus of political discontent. Katniss does not yet see that she has power, but the film intimates the power of her influence, from the workers making the mocking bird hand salute, even though they know that they face beatings and possible death to the Presidents own daughter who changes her hair in imitation of Katniss. No wonder he wants her dead. As a package the Blu-ray is a very worthy presentation of the film. The aspect ratio of the film swaps between 1.78:1, used primarily for the games and 2.40:1 for all other sequences, for the most part it is not noticeable, but it allows the grime of the Districts and the excessive flamboyance of the Capitol to be shown with good effect, whilst bring the audience closer to the action when the games begin. The colours are good, the Capitol is a riot of colour, whilst the districts have a grimy blue/grey wash to them, and the games are presented in the most natural blend. You get a single 7.1 DTS MA audio channel, with optional English subtitles, which works well in separating the various audio elements of the film. 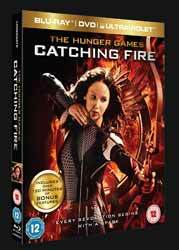 There are a number of extras on the disc, including an informative full length commentary by Francis Lawrence and producer Nina Jacobson. There are small number of deleted scenes (4 min, 35 sec), mostly these are little more than snippets. The greater part of the extras resides in the ‘Making of’ segment (2 hr, 24 min, 55 sec) it’s a multi-part look at the film, each part can be played separately or as one single segment. One of the things I liked about it was that there was very little ‘lovey’ tosh, well there was a bit for about ten minutes, but primarily the extras talk about the film, which is rarer than you would think. Ultimately, the film added enough layers to differentiate it from its predecessor.